My neighborhood in Watertown is a little hit-or-miss for trick-or-treaters (needless to say Halloween was a night in, I am old and have a baby, so even with the holiday falling on a Saturday there was no way I was going out myself). Most of the people in our area have lived here forever or are the late 20s/early 30s couples making the transition from city living to the suburbs, so there aren’t a ton of kids in that peak age range for Halloween excitement. This is our third fall here, the first year we got a handful of trick-or-treaters, the second year was quite a few more, and this year was back to a handful. Each year my wife and I bought way too much candy and even after giving out multiple pieces to each child ended up with a large bowlful at the end of the night. So it looks like there will be plenty of chocolate in my future, delicious if somewhat detrimental to my waistline. Fortunately it is November, so it is officially the start of porter and stout season! If you are going to pick beers to pair with chocolate you’d have a hard time beating a good malty porter or stout. One stout that I enjoyed this weekend was Standish, the imperial stout that was one of the latest releases in Mayflower Brewing Company’s outstanding Cooper’s Series. 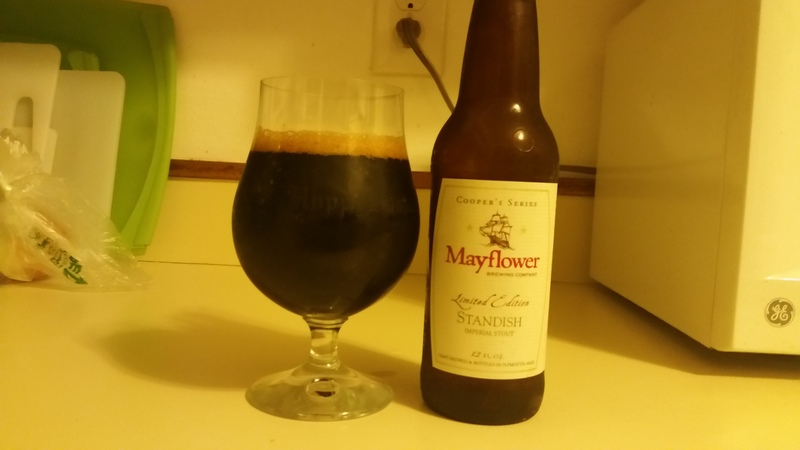 Mayflower brewed Standish in May but let it condition for several months to help mellow out any harsh alcoholic flavors that can be present in bigger beers. The imperial stout is currently available on draft and in 12 oz. bottles.